Thank you to YUMMLY for publishing another recipe. Can't take my eyes over the rolls, lovely filling and tempting to goodness. Ridwan, your spring rolls with the spinach and feta are so inviting, and oh, so beautiful...almost too pretty to eat, but I want to eat all the rolls...yumm! Congratulations on Yummly again!! Well done!! 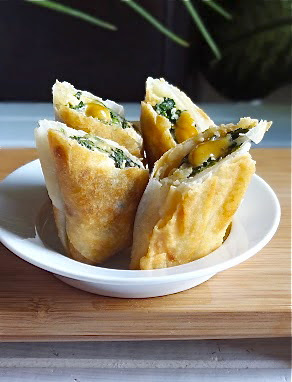 I love spinach and feta and you had a great idea matching them up with spring rolls!! Have a great weekend!